Mr. Navaratnam warned Tamils, at an early stage, of disastarous consequences of the strategy of winning freedom solely through political means of agreements and pacts, with a brutal oppressor. 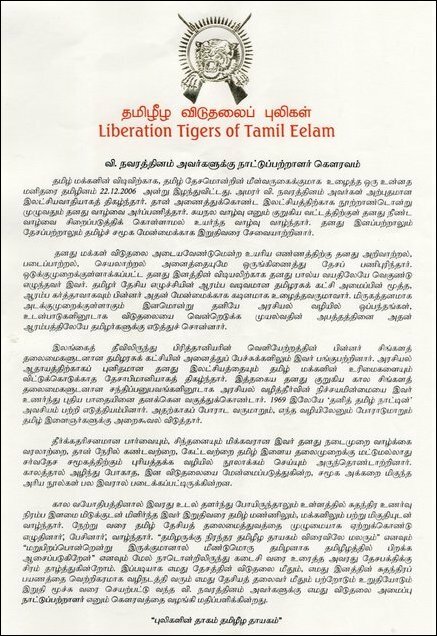 The co-founder of the Federal Party, with his vast experience from early negotiations and a perception of foresight, made a clarion call to the young generation of Tamils, as early as in 1969, to struggle for the Tamil homeland, the statement issued in Tamil said. Mr. Navaratnam has also done invaluable service by writing an autobiography about his contemporary political life, in book form, to be understood not only by the younger generation but also by the international community, the statement said.